El Chessico – The Result! 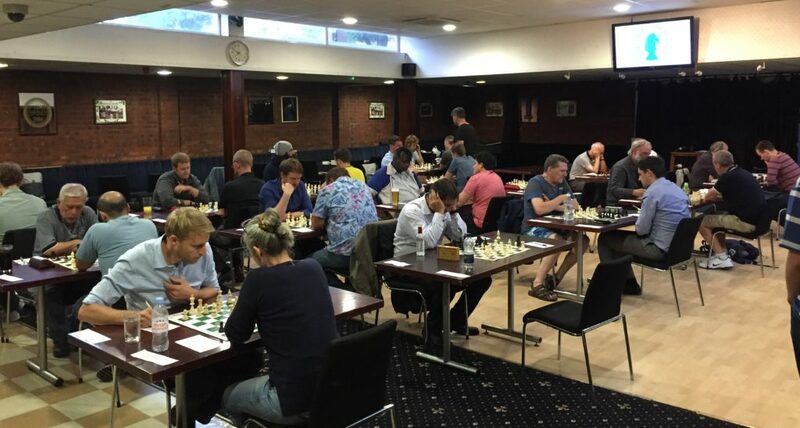 Tuesday evening saw the second and deciding leg of our Summer double-header against Battersea Chess Club, dubbed “El Chessico” by those in the know. 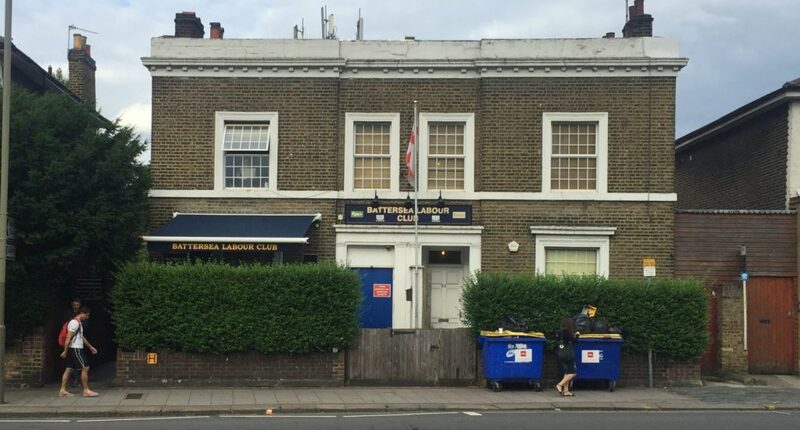 We had the pleasure of visiting their home venue – Battersea Labour Club – and what a venue it is! A lovely centre near Clapham Junction with ample room, audio visuals, and pints from £2.35!! Mike Mackenzie was overheard describing it as “a hell of a drum”. Our hosts were equally hospitable – I’m planning my return trip as we speak! Down to business though – the 15-board return leg was fabulously well organised – credit to Aldo & the Battersea folks for the arrangements. It was an even match up across all boards and the game played out accordingly, with a handful of games going right down to the wire. It could easily have gone either way, but by the end of the evening the teams couldn’t be separated and the match ended drawn at 7.5-7.5, handing Hammersmith a win over the two legs, 1.5-0.5. 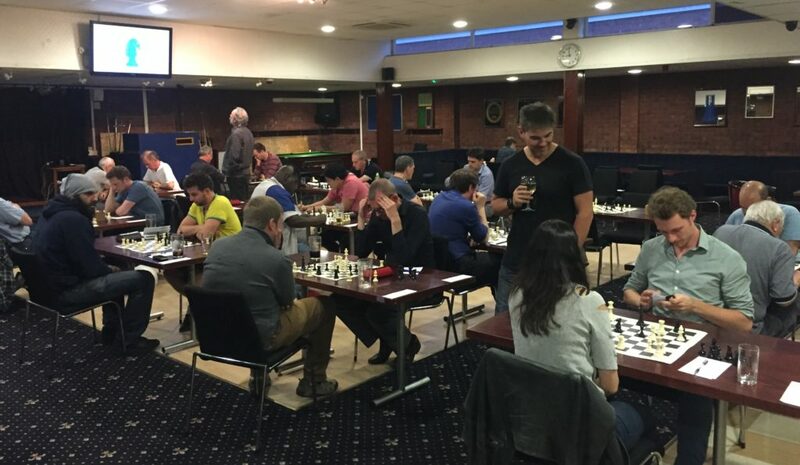 A full house – 15 boards of chess! 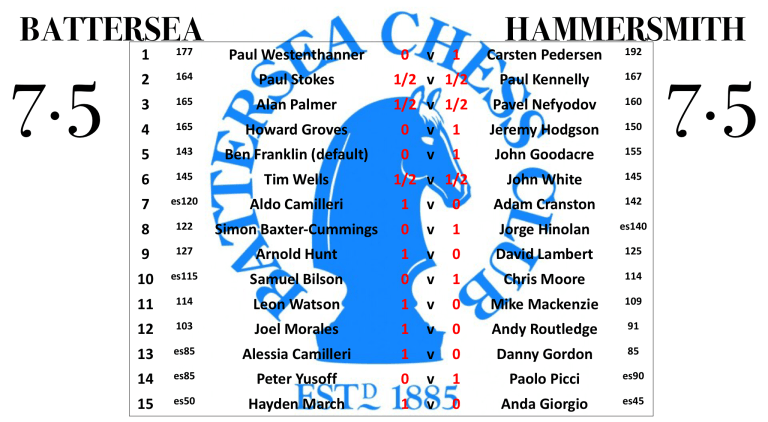 A few of the Hammersmith results deserve a shout out – firstly to Paolo for winning on his competitive debut for the club; Jorge also picked up another win in his second outing for us; Chris continued his excellent form with yet another result! ; Carsten secured a tasty victory with a 10 move forced combination, and Jeremy secured a hard-fought win after a hair-raising struggle in the middle game (described as “a humdinger of a game”!). John, Pavel and Paul all with creditable draws in the mix too. Thanks again to our hosts and opponents, and to everyone who turned out over the two legs (27 boards in total – quite a feat!). Well done to Hammersmith for the narrow victory, and here’s to making this an annual fixture!! Battersea’s match report can be found here.